Debra A. Shattuck is Provost and Associate Professor of History at John Witherspoon College. 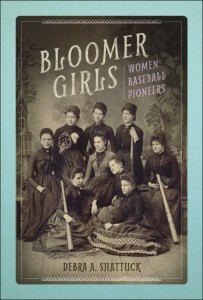 She recently answered some questions regarding Bloomer Girls: Women Baseball Pioneers. Q: Your book examines how baseball has been gendered as masculine, and uncovers historical evidence that runs counter to that narrative. Can you summarize some of the factors that contributed to coding baseball as masculine gendered? Debra Shattuck: The transformation of baseball from a gender-neutral game played by boys and girls, men and women into a highly-gendered sport was a long process that unfolded over the course of the nineteenth century and into the early twentieth century. It involved many factors relating to evolving socio-cultural attitudes toward women, the role of sport in society, and U.S. nationalism. Another significant factor that solidified baseball as a “man’s game” was the emergence of professional baseball and the institutional structures that emerged to control it. Once baseball became established as a “business” it was relatively easy for power brokers in the media and formal leagues to shape discourse about the sport. This discourse increasingly focused on baseball’s purported ability to inculcate robust “manliness” in participants, to reinforce (white) “American” values, and to promote U.S. “civilization” abroad. By the beginning of the twentieth century, lingering concerns about the physical strength and stamina of women, coupled with emerging ideals about the importance of modifying sports to encourage people of all physical abilities to participate, led physical educators to create a separate version of baseball. This modified sport of “women’s baseball” supplanted the “man’s” game on college campuses and playgrounds across the country. Softball emerged soon after, presenting a “separate yet unequal” baseball substitute for girls and women that continues to represent a cultural obstacle to girls and women who want to play baseball. Q: How did the emerging women’s rights movement shape media coverage of women’s baseball at the time? Shattuck: I had initially assumed that many, if not most, nineteenth-century women’s baseball teams had emerged out of the women’s rights movement. I was mistaken. Because baseball’s gendered identity had not yet solidified until the late nineteenth century, I learned that the majority of girls and women played baseball for the same reason their male counterparts did—because it was fun. Despite this reality, there were cases where detractors sometimes attributed female baseball playing to the broader women’s rights agenda. In 1867, for example, after listing numerous previously male-only jobs that women were now performing, a reporter announced in a worried tone–“and we shall presently hear of female base ball and cricket clubs!” The caption of an illustration of a female baseball game at Peterboro, New York in 1868 read: “The Last [Latest] Illustration of Women’s Rights—A Femele (sic) Base-Ball Club at Peterboro, N.Y.” These examples, notwithstanding, the majority of negative comments about female baseball players through the 1880s focused on their physical frailties and shortcomings, not their intrusion onto the all-male sanctum of the baseball diamond. Those criticisms proliferated after the turn-of-the century when organized baseball operations run by groups like the American Legion and Little League began promoting baseball as a tool for turning boys into healthy, responsible men and moral leaders. teams in the 19th century? Shattuck: Baseball scholars have not yet fully chronicled the intersections of race and baseball. Many scholars specialize in the study of blacks and baseball but more remains to be done to assess how other racial groups interacted with the national pastime. There is evidence that immigrant groups embraced baseball as a way to assimilate and gain acceptance as true “Americans,” but, apart from the aforementioned studies of blacks and baseball, we have only scattered accounts of teams of Chinese, Japanese, Native Americans, and other racial groups in the nineteenth century. While I had hoped to thoroughly document and analyze black women’s involvement with baseball in the nineteenth century, lack of primary evidence precluded that. Either black girls and women did not have as many opportunities to play baseball that their white peers or black boys and men had, or they did not document their participation (in photographs, diaries, scrapbooks, letters, etc.) as well as others did, or they did document their participation, but those sources were lost to history. All are probably true. There were many black men’s baseball teams in the nineteenth century but only a few examples of black women playing baseball. Newspaper accounts of teams like the 1883 Dolly Varden and Captain Jinks of Chester, Pennsylvania by white journalists was overtly racist. Nonetheless, I suspect that, just as white girls often joined boys in pick-up games or on schoolyard teams, black girls likely did the same. I also suspect that black women organized baseball teams at black colleges but have yet to confirm that. As more black newspapers and cultural artifacts are digitized, scholars will likely find additional evidence of black female baseball players and the question of race and gender can be more thoroughly analyzed. Q: You say in your book that the earliest female professional baseball teams “performed baseball”. What do you mean by that, and how did the theatrical performance of early female baseball teams affect their perception in the public eye? Shattuck: The earliest female professional baseball teams–the Springfield Blondes and Brunettes (1875), the English Blondes and American Brunettes of Manhattan (1879), and the Female Blue Stockings of Philadelphia and Female Red Stockings of New York (1879)–were comprised of teenagers and young women drawn primarily from the ranks of circus and theatrical troupes. Few had experience playing baseball. They spoke of their uniforms as “costumes,” mimicked mannerisms of male players (“kicking” at umpires, for example), and purposely incorporated humor into their games (forming bucket brigades to relay balls in from the outfield, skipping around the bases, etc.). While later female professional teams feature highly talented athletes and skilled ball players, the early professional teams of the 1870s mirrored the highly popular theatrical form known as burlesque. Burlesque arrived on U.S. shores from Britain in 1868 and featured biting social parodies and reversed gender roles. Almost immediately, burlesque theaters around the country began adding acts featuring “female nines.” The popularity of burlesque and baseball gave rise to a new theatrical form I call baseball burlesque al fresco—baseball removed from the confines of wooden stages and footlights to the green grass and bright sunlight of outdoor baseball diamonds. Reviews of these performing baseball teams were mixed. Many spectators thoroughly enjoyed the new form of theatrical entertainment while others excoriated female players as sexually immoral and a blight on the national pastime. Q: How did the “Gibson Girl” ideal that emerged in the 1890s impact women’s participation in baseball? Shattuck: It was during the 1890s that the “road not taken” in the gendering of baseball made its most obvious appearance. During this decade, attitudes toward physical fitness for women changed dramatically and women took up cycling, tennis, golf, basketball, weightlifting and other sporting activities in unprecedented numbers. Many finally abandoned corsets and tight-fighting clothing for the freedom of bloomers and loose-fitting gymnastic attire. Cultural images of women began featuring strong, robust women instead of shapely, subdued women. With physicians and physical educators urging them to be more active, girls and women joined baseball teams too. Most U.S. states and territories had female teams in the 1890s, including five (Arizona, South Carolina, Georgia, Wyoming, and Nebraska) that had never had them before. It was during the 1890s that men’s teams attempted to capitalize on the new fascination with robust womanhood and hired talented female baseball players (like Lizzie Arlington) to play for them; this was a sure way to boost ticket sales. It was also during the 1890s that professional women’s baseball teams comprised of skilled athletes proliferated. Rather than relying on silly antics and novelty to entertain fans, these teams barnstormed the country challenging men’s teams to contests and wowed crowds with their pitching, hitting, and fielding expertise. These Bloomer Girl teams endured well into the twentieth century until the popularity of softball and other factors led to their demise. The 1890s presented the most obvious opportunity for girls and women to solidify their place as equal partners in the national pastime. But, while cultural definitions of “true womanhood” shifted during this era, so too did attitudes toward the importance of physical education, sports and play in molding individuals into virtuous and healthy citizens. One emerging ideal that affected the gendering of baseball was that sport and play should be accessible to all—not just to a talented few. Consequently, male and female physical educators began modifying sports like basketball and baseball to make them less taxing for (and theoretically more appealing to) children and female players. By the late 1920s and 1930s, official rules for “women’s baseball” were disseminated and a governing structure for the sport of softball emerged. Adults steered schoolgirls, female collegians, and other young women into these baseball surrogates and the “road not taken” slowly faded from view. The line between “men’s” baseball and women’s baseball and softball grew into a chasm and baseball’s reputation as a “man’s game” was solidified. Q: Do you have a favorite athlete or team whose story you uncovered while writing this book? Shattuck: Not really. I found the entire scope of female baseball in the nineteenth century to be fascinating. When I originally set out to write my book, I expected to begin with the nineteenth century and end with the demise of the All-American Girls Professional Baseball League in 1954. I was shocked to discover the extent to which girls and women played baseball in the nineteenth century and was immediately struck by the question: Why did this gender-neutral game end up so highly gendered as a “man’s game.” That became the focus of my book and every newly-discovered female baseball team and player of the nineteenth century became a treasure that I could present to today’s female players as an encouragement to keep playing despite criticism that they are usurping a male privilege. They are not. Baseball has always been women’s game too; today’s players are part of a long line of female baseball players that stretches back to the earliest days of baseball. By understanding the history of the national pastime more accurately, girls and women today have a better chance of unraveling baseball’s gendered narrative and restoring it to its gender-neutral form. Batter up!